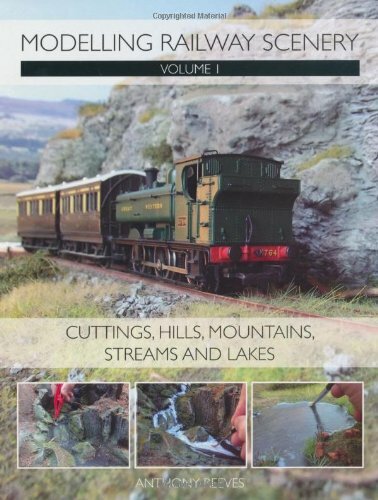 Modelling Railway Scenery: Volume 1: Cuttings, Hills, Mountains, Streams and Lakes is and interesting new title from Anthony Reeves. Whether you are just starting out in the hobby of scenic railway modelling, or are more experienced and are revamping an existing layout, this invaluable instructional volume will guide you through the art of using basic materials to create wonderful model scenery. Brimming with practical advice and tips, the book shows you how to create realistic cuttings, natural rocky outcrops, grassy hillsides, steep cliff faces, waterfalls, streams and lakes, as well as weeds, plants and foliage. Modelling Railway Scenery is well illustrated with over 300 colour photographs. I particularly like the way the chapters of the book are divided up by project and provide really good coverage of the tools and materials you will need and then fully explains the modelling techniques that are required with some great step by step instructions. Anthony Reeves is a keen modeller who has been interested in making models of scenery for many years. In 2003 he started a company called TREEMENDUS, which supplies hand-made scale model trees and scenic modelling materials to railway and military modellers throughout the world. He has created many scenic models and is the author of several articles on various aspects of scenic modelling, which have been published in various railway modelling magazines.